I love gougères! 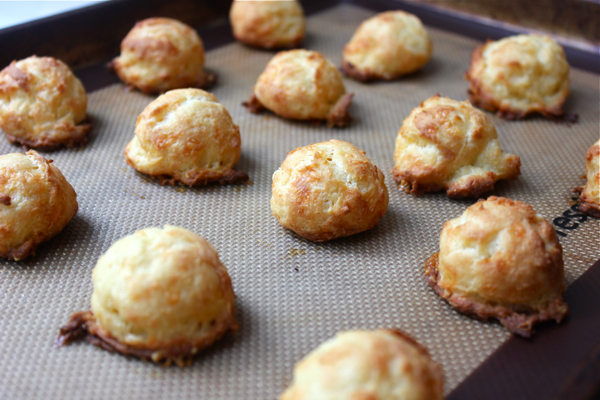 Gougères are French cheese puffs that are cheesy, airy, and utterly addictive. I first had them in Bourgogne on a family’s small vineyard. They served us gougères as a palate cleanser between our different sips of wine, and I couldn’t get enough of them. I knew I had to make them for myself, but getting the gougères to turn out like those at the vineyard wasn’t easy. After much trial and error, I have gotten them to be just as I want them. And I can’t stop eating them. Gougères are surprisingly filling, and they have turned into a full meal for me on more occasions than I’d like to admit. Also, if you’re in the DC area and don’t feel like making these yourself, Central Michel Richard serves up some pretty delicious ones. UPDATE: this recipe has proven less than reliable over time (smoke alarms and wasted cheese). I posted a revised recipe that produces consisteltly light and puffy results. 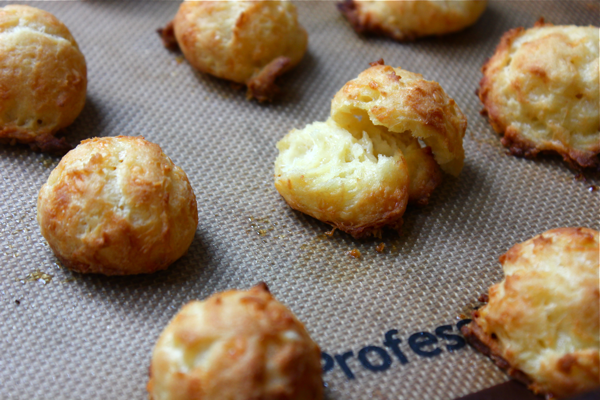 To make gougères for yourself, start by preheating your oven to 425ºF. 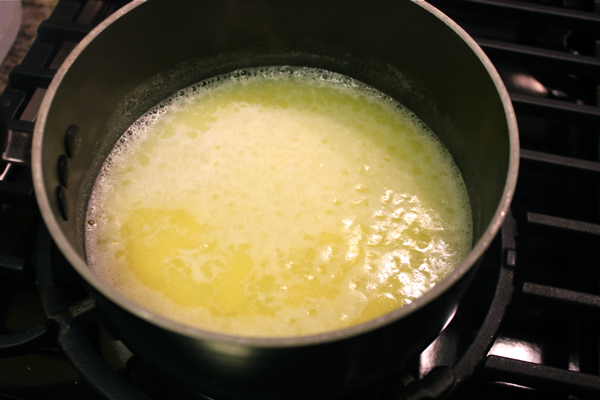 Then, in a small pot, bring 1 cup of water, 1 stick of butter, and 1 teaspoon of salt to a boil. While these ingredients heat up, grate 1 cup of gruyère cheese by hand on the smaller holes of a box grater. You may be tempted to use a food processor’s grating attachment to speed up this process, but unless your food processor has a small hole option, don’t do it. The larger cheese shreds tend to fall to the bottom of the gougères while they’re baking and burn. Learn from my mistakes! When the butter and water come to a boil, remove the pot from the heat and pour in 1 cup of flour. 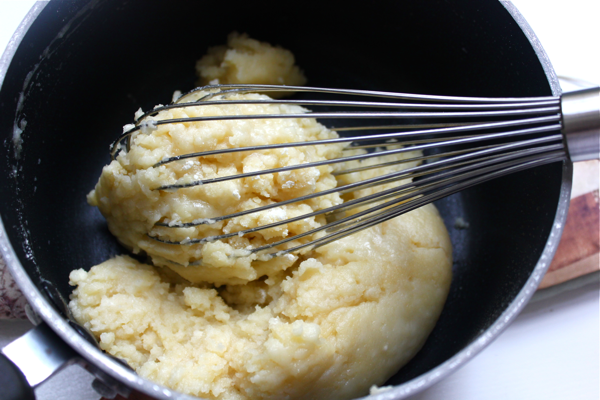 Using a WHISK, mix it all together until it forms a ball that pulls away from the sides of the pot. I added 1 teaspoon of cayenne pepper to the mixture at this point to give it a little kick, but you should omit the pepper if you’re going for classic gougères. Then, crack 1 egg into the pot. 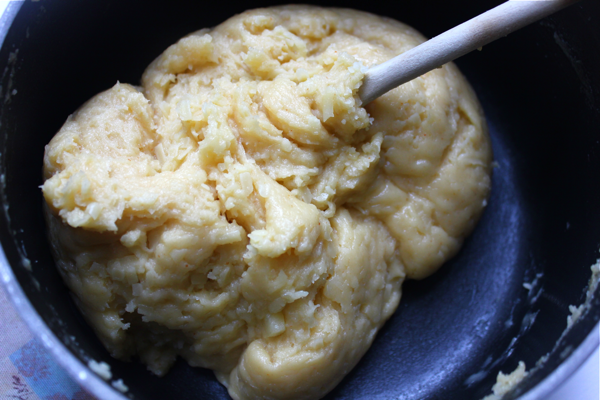 Using a WOODEN SPOON, mix the egg into the batter until it is fully incorporated. The egg will be really slimy and hard to mix at first, but keep going, and it will work in nicely. Repeat with 2 more eggs, one at a time, for a total of 3 eggs. Then, add your cup of shredded cheese into the batter, and mix it until it’s fully incorporated. I’ve made jalapeno gougères before, and they are deliciously spicy. If you want to make those, you can mix 1 finely chopped jalapeno in when you add the cheese. 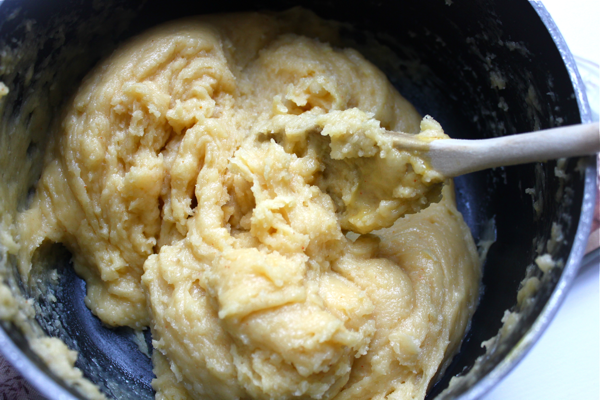 Drop tablespoon sized lumps of the batter onto an ungreased cookie sheet about 1 inch apart. If you’re making gougères in bulk, it might be easier to put all of the batter into a pastry/plastic bag and pipe it onto the cookie sheets. 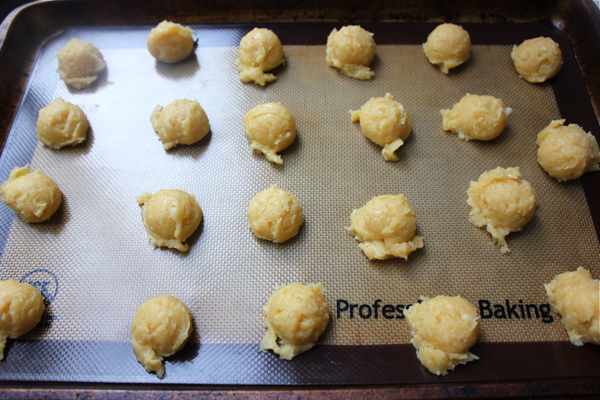 Bake the gougères on your oven’s middle rack for 15 minutes, making sure to rotate the pans half way through. The gougères are done when they are golden brown, crisp on the outside, and sound hollow when they are tapped. Gougères are best eaten hot out of the oven, but you can also store them in the fridge and reheat them at 375ºF before serving. I could eat these forever. I made these particular gougères for a Eurovision party and was seriously concerned that I’d eat them all before arriving. It’s a valid concern. You’ve been warned!! I have been waiting for this recipe to go up on Wittyinthecity! So amazing, I’m in the kitchen tomorrow for these! Just curious, how much does this recipe make? It makes about 30-35 gougeres. One batch should be enough for 10-15 people at a cocktail party.